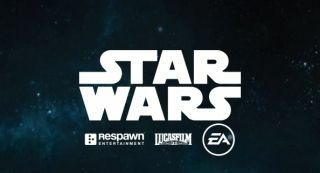 We finally got a glimpse of Respawn Entertainment's Star Wars Jedi: Fallen Order, thanks to premature listings by Amazon. Jedi: Fallen Order may not be scheduled for an official reveal until April 13, but that didn't stop Amazon posting listings for the game's teaser poster and even a t-shirt. While it's not exactly an in-depth first look, the leaked artwork does confirm you'll be playing as a Padawan Jedi - although it's hard to determine what they look like as the image shows the character from behind. However, your Padawan is wielding a blue lightsaber which is an indicator that you'll be a Jedi Guardian like Anakin Skywalker and Obi-Wan Kenobi - who predominantly use the Force physically. Whether you'll get an option to choose your class hasn't been confirmed yet. In addition, the poster shows a crashed Star Destroyer in the background and a small scanning droid accompanying your character. We can only assume that means you'll be spending some time scavenging the ruins of the Republic with the help of a mischievous little friend, in the vein of C-3P0 or R2D2 - well, we hope.